Why is it that many yachting customers own highly customized yachts, but when they look to purchase a yacht tender, they end up researching and looking for tenders built from an assembly line process? We can’t answer that question, but we can build a line of elite custom tenders that match the quality and craftsmanship of many leading yachts seen on the waters today. Thanks to our many happy customers, the Skipper line of custom tenders is expanding to four models in 2015 and continues to turn the heads of many marine industry enthusiasts and yachtsmen alike. 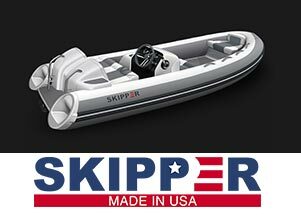 The Skipper line of custom tenders is the premiere brand on the market today. All of our models have standard features as part of the built process. This custom build process all starts with the quality and attention to detail that all our customers deserve and expect. Skippers are not an assembly line built tender. Every model is custom built specifically for our customer. The most comfortable helm seat and cockpit bar none! For more information on the amazing Skipper custom tenders, contact Skip Reisert for a detailed explanation of how the Skipper line of tenders are a perfect choice for your yachting needs.